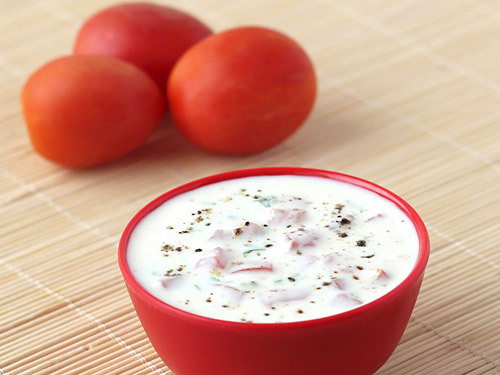 Tomato Raita is one of the easiest condiment recipes which does not require any cooking and can be made at home by combining chopped tomatoes and curd. The coriander leaves, cumin powder and chillies used in this recipe simply transform it into one of the best raita you will ever make. 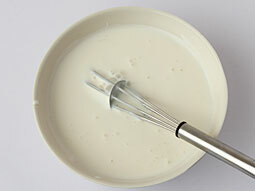 Take curd in a bowl and beat until smooth. Cut ripe tomatoes into halves and remove seeds. Dice them into small pieces. 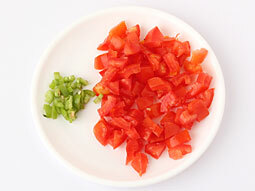 Add chopped tomatoes, chopped green chilli, chopped coriander leaves, cumin powder and salt. Mix well and taste for salt. If required, add more salt. Transfer it to a serving bowl and garnish by sprinkling black pepper powder over it. Take red ripe tomatoes or those which are less sour in taste to make it. 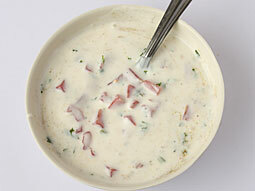 Add 1/2 chopped onion and/or 1/3 cup chopped cucumber for variation. Garnish with mustard seeds and asafoetida tempering instead of black pepper powder for variation in taste. Serving Ideas: It is a perfect accompaniment to be served with aloo paratha, mooli paratha, etc. 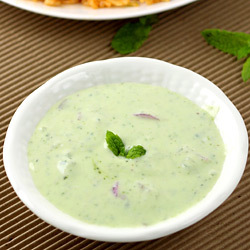 Many Indian rice dishes like vegetable biryani, lemon rice, etc are unimaginable to be served without tomato raita. I have been cooking dishes using this website recipes. My family loved it thank you. I just want to know what other sides compliments the vegetable pulao? I mean like gravy types. 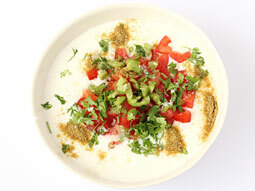 Can this tomato raita recipe kept for a day? Response: Hi Vemesha, you can serve cucumber raita, boondi raita or plain curd as side compliments to pulao. If you want to keep tomato raita for a day, prepare the raita without adding tomato in advance and store it in refrigerator. Add tomatoes at the tome of serving.